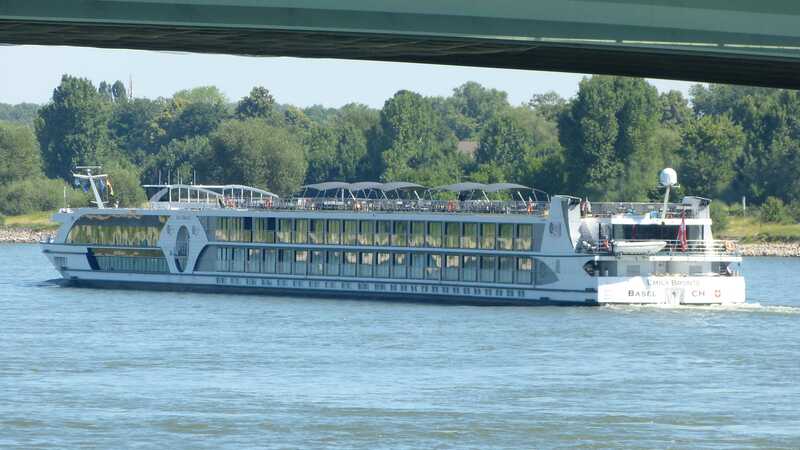 A Rhein cruise ferry, M.S. 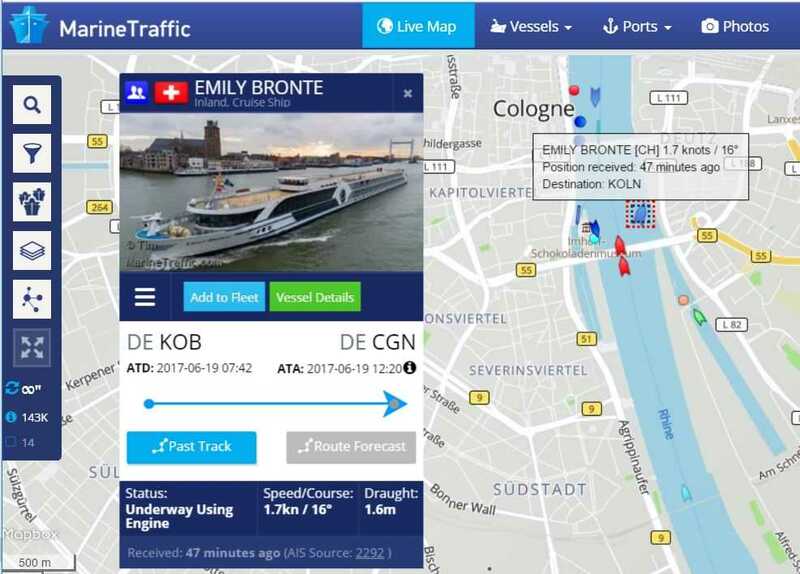 Emily Bronte of Riviera Travel, came through Bonn this morning and thanks to modern technology I timed a meeting and caught a glimpse of her. My Mum that is! Tracking a wonderful cruise ship. M.S. Emily Bronte. 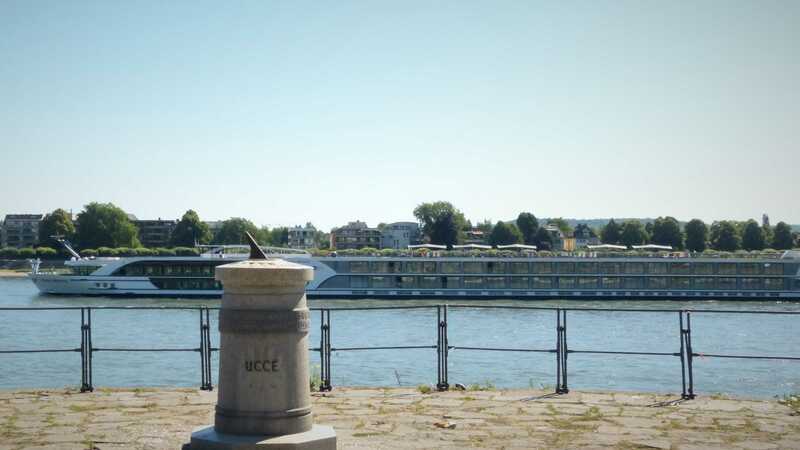 There are about 1000 ships on the Rhein at any one time. 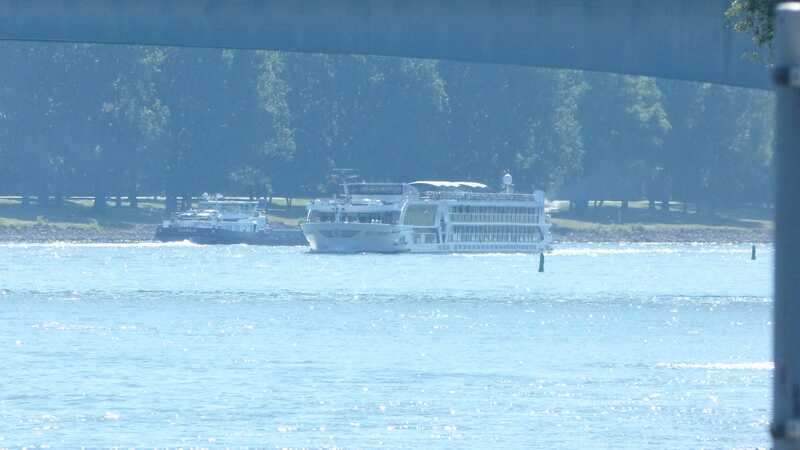 As I look at a live tracking map there are 84 passenger ships between Koblenz and Düsseldorf, one of the most popular sections of the Rhein. Last night I met one of those ships as it docked in Koblenz. The M.S. Emily Bronte, launched this year, has 88 cabins and is impressively fitted. Cruise ferries have been part of my life. Felixstowe to Zeebrugge was a booze cruise we used to take as kids. It was a grim experience for anyone that was sober. Since moving to the mainland of Europe I’ve been through the Hook of Holland, Dunkirk and Calais more times than I can remember. 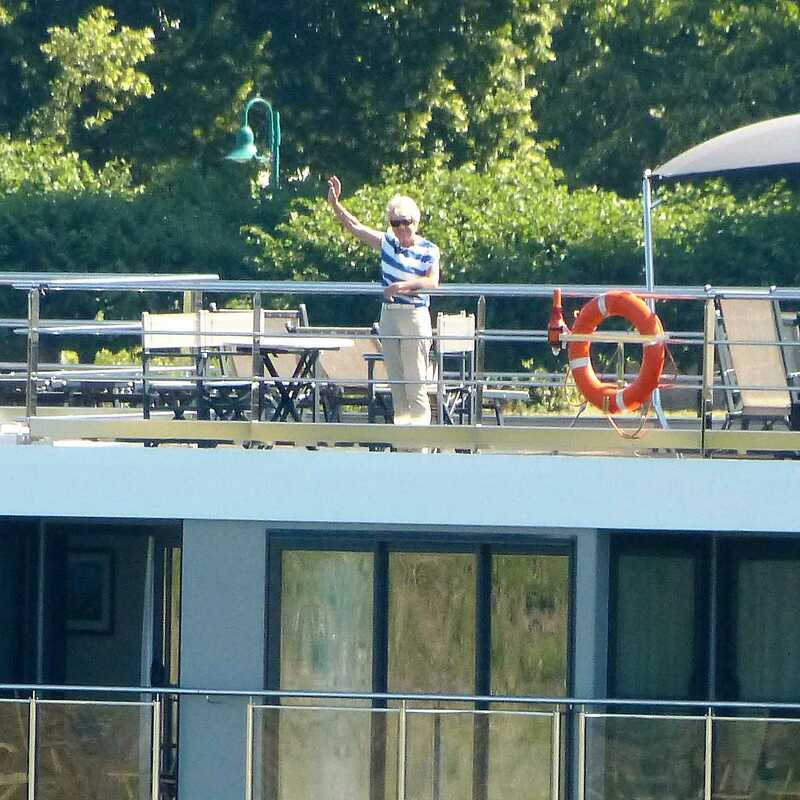 I’ve also done day cruises from Bonn on the Rhein. It appears that my idea of a cruise has been tainted. These ‘bus routes’ have nothing in common with the Rhein cruise ship I saw last night. Yes, these are targeted at over 60’s and yes. 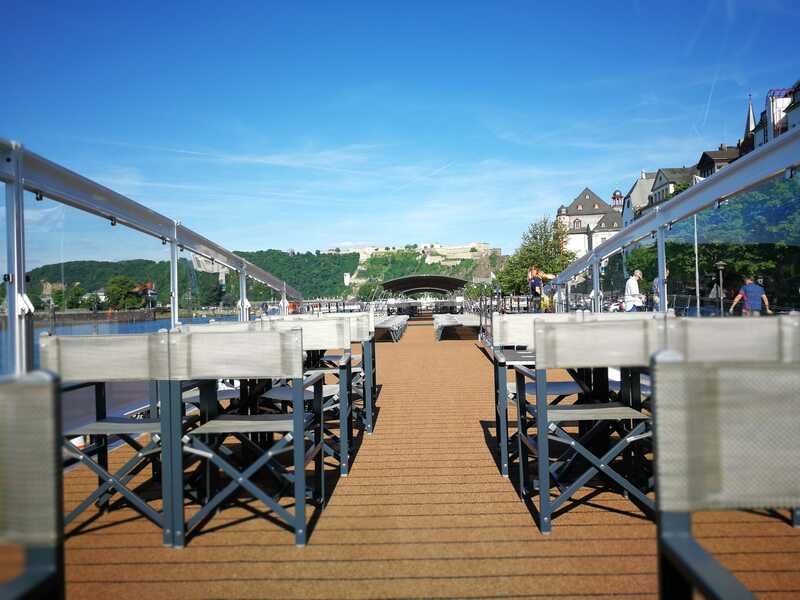 you won’t find much to do on board apart from eat, talk and sleep but if you want to explore some of the towns and cities along the best part of the Rhein you can’t do it in much better than this. We sat down in the Bistro an enjoyed a very good meal with great service and a nice atmosphere. 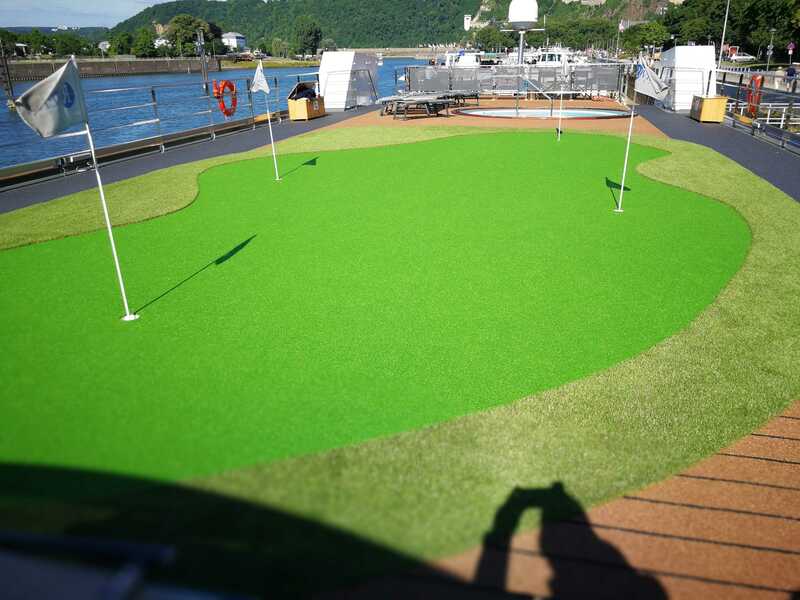 We walked the sun deck and took a look at the mini putting green and we sat in the evening sun as tourists on the promenade looked on. What a life. The fit and finish of the ship is very classic styled with lots of brass and fancy lighting, traditional colors. It clearly leans towards the mainly British customers taste. Rooms are of the ‘London double room’ size which means there’s not a lot of space around the beds but I loved the ceiling-to-floor sliding doors that allow you to sit and look directly out on the water. This is quite possibly the best way I can think of to relax. I don’t go on trips without taking the chance to test some technology so it was with excitement that I found Marine Traffic, a website that offers free ship positioning for most of the worlds waterways. It didn’t take long to find M.S. Emily Bronte and with perfect precision I finished my coffee and spotted the good lady coming round the bend under the Konrad Adenauer bridge in Bonn. I few minutes later, and there she was! Perfect timing and perfect tracking of M.S. Emily Bronte. Emily Bronte under the Kennedy bridge in Bonn. 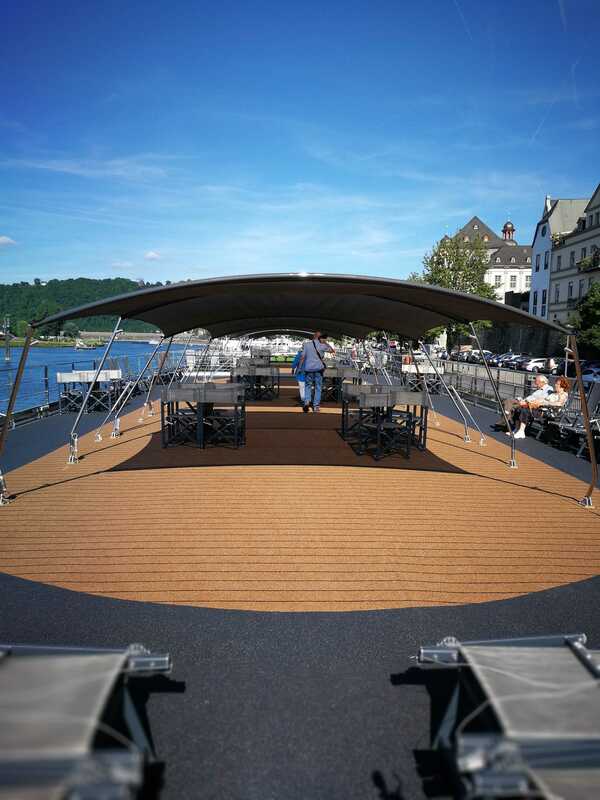 Bingen to Bonn on the Rhein, in a modern way? I’ve cycle-camped my way up the Rhein and I have to say that this is one of the highlights. Sure, the Bodensee is incredible with the Alps in the background but Bingen to Bonn is possibly better. Why isn’t there an option for younger people? I’m not talking about a Party Schiff though because I’d like to see something like Emily Bronte done in a modern style. Less formal eating areas, more casual seating and chilled out music. Scandinavian beach-house room styling and a 3 day itinerary with final Captains Party in Cologne as you cruise into the harbor. Could be perfect! For more information, my mother took the Basel – Cologne tour with transport from England via Riviera Travel and you can read more here. « Digital Hub Bonn. Coworking space opens 20th Feb. What next?